The scenic skyline view of Parliament Hill from Nepean Point in the City of Ottawa, Ontario in Canada is beautiful at dusk when the historic buildings are distinctively outlined in the lighting. Parliament Hill in Ottawa, Ontario in Canada is a historic landmark which every visitor should see while visiting the city but the beauty of the historic buildings is stunning during the lighting at dusk. The lights around Parliament Hill become illuminated as darkness takes over in the city and the clock tower becomes the centerpiece of the complex. Standing at Nepean Point in the City of Ottawa, Ontario, the view of the entire area the Parliament Buildings spans is one of the best. This is where the heart of Canada's democratic system takes place and any decisions coming out of these buildings will have an impact on the entire country. 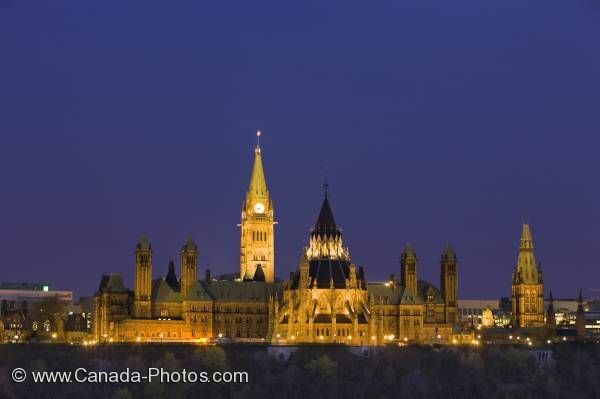 Picture of the lighting at dusk as the buildings on Parliament Hill in the City of Ottawa in Ontario, Canada become illuminated.